“Somewhere You Found My Name” Record Release Party July 26! We’re celebrating the release of Somewhere You Found My Name with a big to-do of a show at Littlefield in Brooklyn on Wednesday July 26th! 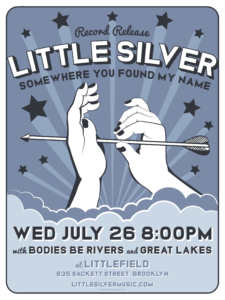 We’ll be playing with Bodies Be Rivers and Great Lakes, and tickets are available here. And Little Silver’s ranks grow 25% for this show (and shows this fall) with the auspicious addition of Kevin Brady on keys and guitar. This is gonna just be plain awesome. Come!